In the early 1990’s, a feeling developed amongst a group of pediatric neuroradiologists that the pediatric subspecialty of neuroradiology was not adequately represented within the American Society of Neuroradiology, the Society for Pediatric Radiology, or in either Society’s annual meetings. The only dedicated pediatric neuroradiology session at the ASNR was an interesting case session that was usually held in a very small room, with CT or MR scans being projected from a light box onto a screen. The ASNR mainly served the private practice neuroradiologist, who made a living by imaging adults. Imaging children was difficult: imaging children took more time, cost more money, and required a special knowledge of normal pediatric development and diseases. Children are different from adults and few radiologists had experience with the changes of the brain that accompanied normal development. Pediatric radiologists were less intimidated by performing MRIs on children, but neither pediatric radiologists nor neuroradiologists felt adequately educated in the development of the brain or its disorders. There were few MR compatible life support devices or monitoring devices and, certainly, none that worked on children. Therefore, most radiologists wanted no part of pediatric neuroradiology and the ASNR programming reflected just that! A few pediatric neuroradiologists, however, believed that neuroradiology of children was important and should have greater representation at the ASNR annual meeting. Derek Harwood-Nash and Tom Naidich were among the most vocal of these. During RSNA in 1991, they approached Jim Barkovich with an idea for a pediatric neuroradiology society that would act as a home for pediatric neuroradiologists and could serve a function in both the ASNR and the SPR. All agreed that it was a good idea, and a necessary step to promote our specialty. However, it was necessary to get buy-in from the ASNR and the SPR if the society was to be successful. The SPR welcomed neuroradiology programming to educate its members. Jim Barkovich was charged with the more challenging task of communicating with other neuroradiology subspecialists to devise a plan that would encourage the spread of knowledge about neuroradiology subspecialties, without detriment to the ASNR. At that time, the other neuroradiology subspecialties were head & neck and nascent interventional neuroradiology (INR). The ASHNR had been in existence for many years and was a fully functioning independent society, but INR was just establishing an identity of its own. Spine was considered to be part of general neuroradiology and functional MRI had not yet emerged. Representatives from the specialties appeared before the ASNR Executive Committee to give their views on subspecialization in an effort to encourage the ASNR to support subspecialty growth and try to keep it within the auspices of the greater ASNR, providing administrative support and diminishing the cost of meeting by holding them within the context of the ASNR annual meeting. The discussions began in the Executive Committee under the leadership of David Norman and continued through the presidencies of Glenn Forbes and, subsequently, Bob Quencer. Ultimately, all agreed that the best course would be to support the formation of subspecialty groups and to draw up a set of rules to govern subspecialty societies and their finances. An organizing meeting was held at the ASNR 1992 in St. Louis and about 70 people attended and signed on as founding members of the ASPNR. 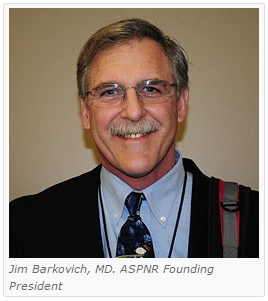 Jim Barkovich was elected president and was invited to the ASNR Executive Committee meetings as the financial and annual meeting details were established. These have not changed substantially since that time. An unofficial executive committee, consisting of Bill Ball, Pat Barnes, Jim Brunbach, Marv Nelson, and Jim Barkovich, met or talked multiple times that year in order to create ASPNR programming. The first official ASPNR meeting was held in conjunction with the ASNR annual meeting in Vancouver in May, 1993. Since then, the ASPNR has slowly and steadily grown as a society and as a presence at the yearly SPR, ASNR, ASHNR, ASSR and ISMRM meetings. Along with the European Society of Magnetic Resonance in Neuropediatrics, it is one of the two leading international societies devoted to pediatric neuroradiology.